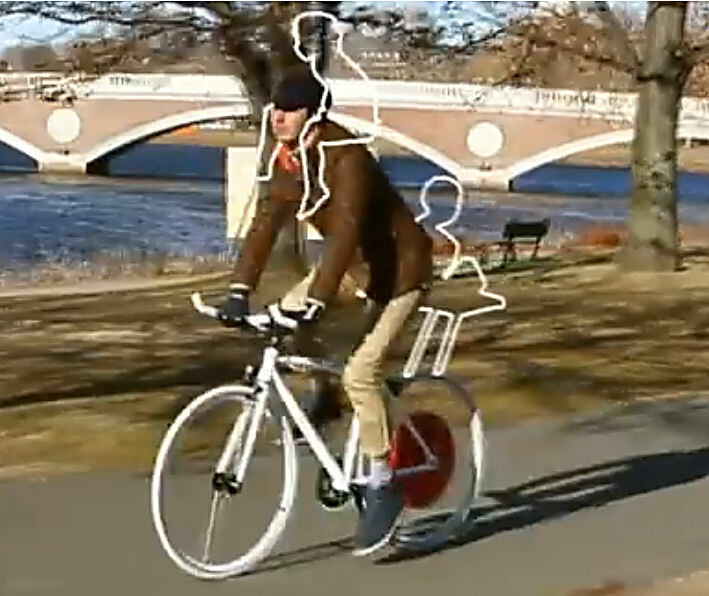 In a post in this blog from 2011, I reported on a product under development at the MIT Senseable Cities Laboratory, the Copenhagen Wheel. It provides an electrical power assist to a bicyclist. The motor and batteries are contained entirely in the rear wheel. The Wheel can be controlled through a Bluetooth connection from a smartphone on the handlebar, so there is no need for wiring. Various smartphone apps can report on speed, distance, state of battery charge, exposure to air pollution etc. I had a serious concern in 2011, that the Wheel was designed to switch from motor mode to generator mode at 12 mph. In other words, if you tried to go faster, you couldn’t: it would feel as if you were pulling a huge trailer. 12 mph is slower than many bicyclists would usually ride and could be hazardous if there is a need to sprint across an intersection before the traffic signal changes, to outrun a chasing dog, etc. Development of the Wheel has continued, and readers deserve an update. The Wheel is now going into a production, licensed to a company called Superpedestrian. Maximum power is now 250 watts, top speed 15 mph in Europe; power 350 watts, top speed 20 mph in the USA — reflecting legal limits. (15 mph, though, is still much lower than a desirable sprinting speed, and many bicyclists can easily sprint at more than 25 mph.) Pedal power is proportional to torque (whether cadence-sensing, I don’t know — torque sensing alone would favor slow cadence and hard pushing. There is a derailleur option which alters the relationship between pedaling torque and torque at the wheel, so this becomes a more serious issue.) Some technical specs are online on the manufacturer’ site. Placing the entire power unit in the wheel makes retrofitting to an existing bicycle easy, but my friend Osman Isvan, who studies electrically assisted bicycle technology, questions the Wheel concept, or any electric motor in the wheel. He says that a mid-drive system with a small, high-speed motor powering through a reduction drive to the crankset is better, because then the motor can be lighter and more efficient. In case you would like to get technical, Osman has an article, “Power Optimization for the Propulsion of Lightweight Vehicles,” where he addresses this issue, among others. The Wheel’s motor may in fact use a gear reduction drive, unlike most in-wheel motors, though it almost certainly doesn’t benefit from the ability to maintain nearly constant motor speed with the motor (like the cyclist’s feet) ahead of derailleur gearing or an internal-gear rear hub. One thing that really caught my eye was the disconnect from safe bicycling practice in the company’s promotional video. 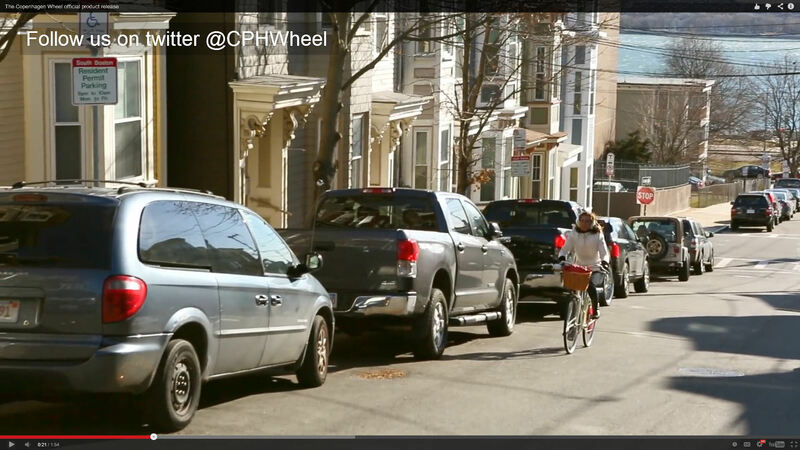 The first photo (above) in this article is from the video and shows bicyclists riding in the door zone of parked cars, at speed. That occurs in the video at 0:45 and 1:45. At at 0:21 and again at 1:39, the Wheel is demonstrated by a bicyclist riding the wrong way on a one-way street, and where a parked car could pull out, but the next parked vehicle hides the bicyclist from the driver, who is on the curb side. There’s this shot of unsecured baggage including a (virtual?) 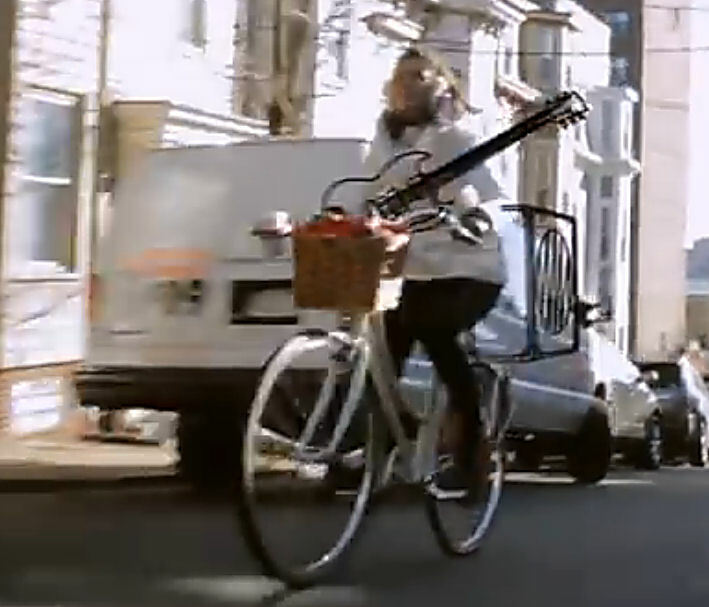 electric guitar which hangs way out past the end of the handlebar — a large virtual amplifier is on the rear rack. And then there’s this shot of a man illegally carrying a (fortunately virtual) small child on his shoulders, and another child sitting facing backwards sitting crosslegged on some kind of platform. The law more or less everywhere in the USA says that children are to be carried only in seats designed for the purpose. Massachusetts law says that the children must wear helmets. Anyone familiar with Our Fair City will know that this clip, like many in the video, was shot on our own Paul Dudley White Bicycle Path. This carelessness in promotion sets me to musing about what we have ahead of us as the increased speed potential (even if only 20 mph) of electrically-assisted bicycles collides with the kind of underdesigned bicycle facilities — essentially sidewalks — which Cambridge is building — a trend now spreading to Somerville and Boston. We’re not talking superpedestrians here, we’re talking bionically enhanced — but not skills-enhanced — bicyclists on bikeways which could only be safe at pedestrian speeds. Allow me to predict that over the next decade, the products of bikeway visionaries and bicycle technology visionaries are going to come together in some rather interesting but also disturbing ways! John Allen asked me to post MY thoughts. Here they are. Warning: they are somewhat inconclusive at this time. Which is inevitable, given that I’m responding to a press release as opposed to a road test. Electric assist bikes (and add-on electric assist devices for your existing bike) have been actively promoted for at least 20 years now. They have steadily gotten better, and people are using them in more ways than you or I could ever imagine. For example, one person I heard about uses an electric assist bike to ride to work and arrive without breaking a sweat. On the ride home at the end of the day, he turns the motor off and gets his exercise. There are purpose-built electric assist cargo bikes that can carry a couple hundred pounds of payload. I heard from an elderly guy who used electric assist to do long-distance bicycle tours that he couldn’t have managed on just his own leg power. And so on. — It’s good looking. As Apple has proven with the plastic cases their computers come in, that matters a lot to people. — It’s all in one piece, with the battery in the hub. That adds a convenience factor. — It has regenerative braking. This is one of the big maybes. In the past, electric assist bike manufacturers have studied the numbers on regenerative braking and concluded it wasn’t worth bothering — too little energy recaptured, too low efficiency, more cost & complication, etc. If these guys are doing it that much better, that’s a big plus. — It studies your riding habits and adjusts itself accordingly. I’d have to experience that to see how I like it. It might take some adjustment on my part. I know perfectly well how I want to control my bike; I think a bike that tried to out-think me in that regard may be annoying. I bet the creators of this wheel are not too concerned about the top speed being less than “many bicyclists can easily sprint.” Their target market is elsewhere. And that market certainly includes the people who will ride unsafely more often with more ease at higher speed.